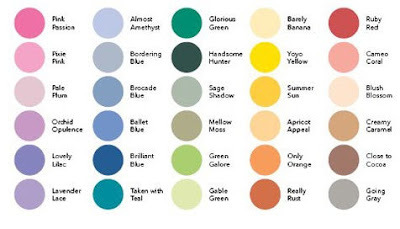 While I think I'll be mourning the loss of Apricot Appeal and my lovely purples for a while, I really am getting excited about these new colors. There will now be 10 In Colors, too, so there will be a lot to choose from. I'm excited about the new Neutrals - I think I'll be using Crumb Cake as a base for a lot of projects! 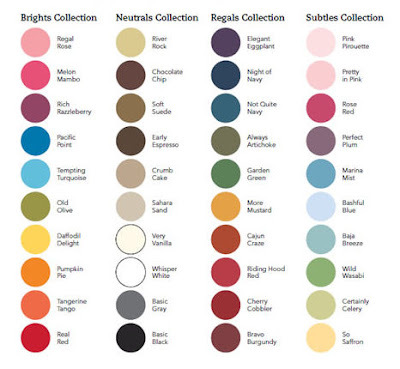 Which of the new colors are you most excited about? Here are the retiring Colors - you'll want to stock up on your favorites before they are gone forever. Some colors are already selling out, so call or email right away to place your order! My mom had to bring Chloe with her to watch my sister's kids this afternoon and when Alyssa saw what Chloe was wearing she ran upstairs to change. 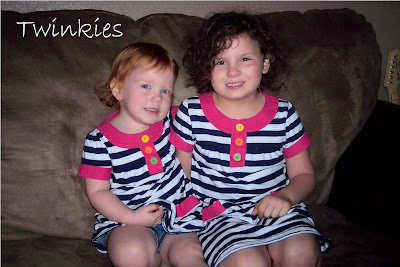 When I got there to pick Chloe up Alyssa proudly announced that Chloe was her twin. Aren't they adorable? There has been some sort of recall on the name brand stuff, and I guess folks panicked and made a run for the store brands, too. Hopefully I'll be able to find some tomorrow or borrow some from a friend. I don't need her to start having seizures again. She will have to go to the doctor tomorrow - hopefully it's something they can treat and not a random virus. Here's to another night without sleep. Feel better, Chloe baby. 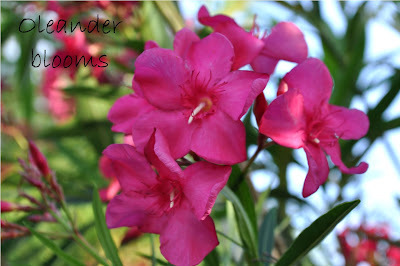 My oleanders are finally blooming! I was worried that they wouldn't make it - they looked quite dead after this winter and it took them a long time to green up this spring. But, now they are covered with their gorgeous flowers and the back yard smells heavily of their lovely scent. 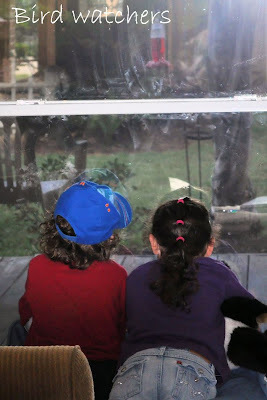 The kids love watching the hummingbirds as much as I do. I would guess we probably have about 25 or so of them in the back yard right now and they are always chasing each other away from the feeders. (I need to put some more out there so they don't kill each other.) You would think they kids would get tired of them by now, but they don't. This morning they were done getting ready for school and they just hung out there watching them while I finished getting ready. It was sweet how they were sharing the chair and not fighting - usually I worry about THEM chasing each other! Just a few years ago I ached to have days like this. I prayed, longed, and wished to finally be blessed with children. 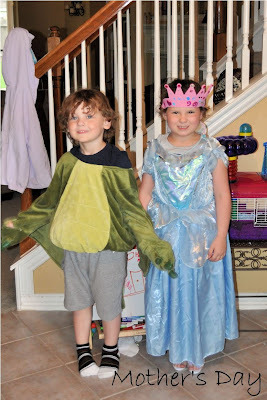 I thank God (almost) every day for these two precious darlings. 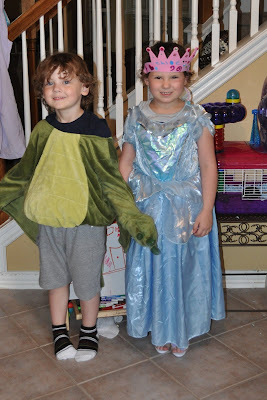 I know every mom thinks her kids are the cutest - but, really - mine are pretty dang cute. They called me into the room, had me close my eyes, and then screamed, "Happy Mother's Day," and jumped aside to reveal their picture for me. I'm trapped in the tower, but Chloe promises they'll rescue me before the dragon eats me for lunch. Now THAT is a Mother's Day gift. I borrow my sister's dog, Bella, today for a school project I'm doing on operant conditioning. 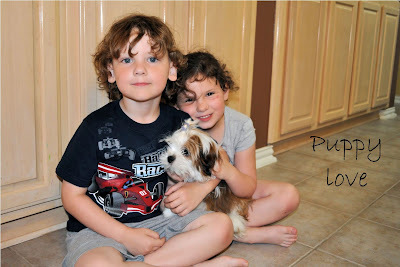 Her 3-month old shih tzu needed to learn some basic commands and a few cute tricks. My kids were thrilled that they got to play with her and she's even going to spend the night. This is the kind of dog we need to get. Tiny teeth. Anyone have any puppies available? The kids told me they had a surprise for me. Their Mother's Day Castle. That's me in the window and Charmander is singing to me. Because, of course he is. This little guy (actually, I think it might be a female ruby throat) guards the hummingbird feeder closest to the porch. 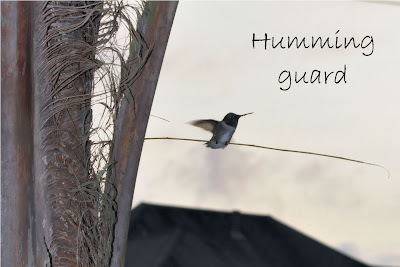 Any other hummer that comes close gets chased away with a loud, angry cheep. This is one of our dead palms, though, and it will probably come down next weekend. We're going to have to put another good-sized tree here or she'll have no perch from which to survey the land. 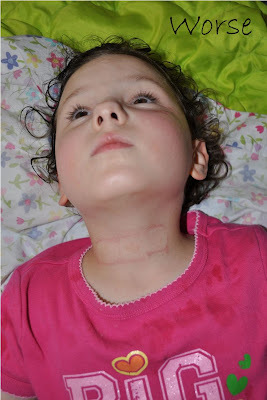 Just when we thought poor Chloe's luck couldn't possibly get any worse (what with her dog bite, first zit, and seasonal allergies) - she caught ringworm. On her neck. I probably brought it home from school (we have a kiddo who seems to have it constantly) on my clothes. 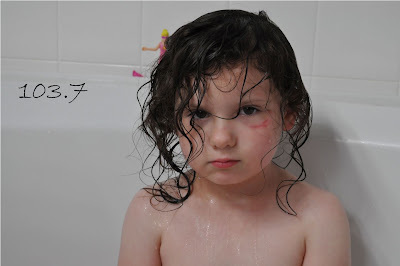 Well, she can't have it exposed at school, so we put the medicine on and covered it with a bandage. Which, turns out, she's also allergic to. Just like her Mama. We are having a rough Spring. 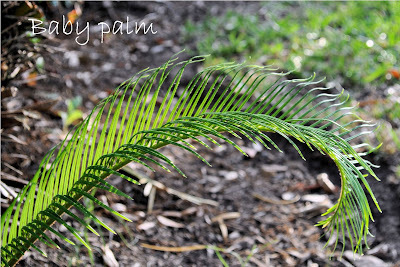 Some of our palms did not survive the horrible winter, but this one sure did - she is having babies. I'll have to transplant them soon so they have more room to grow. When I was a little girl I actually had the Little Pony Castle (I wonder if it's in the attic, too). But, Chloe does fine making her own castles and kingdoms. She will spend a good hour setting up a scene precisely the way she wants it. She worked on this one all afternoon. 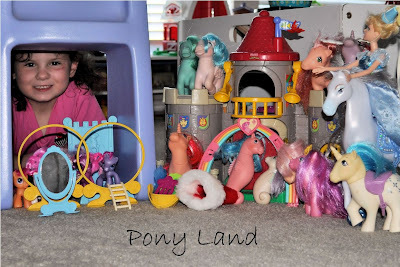 This is Pony Land - where (according to Chloe) "all the ponies are smart and pretty and know where to stand." Yes, that's my girl! I promised Bradley a bubble gun if only he would wear his horrible recital costumes - and he did. 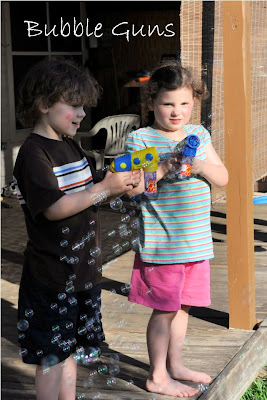 So, today I took the kids out on the patio after dinner to play for a while Pretty much the most fun you can have under $3!! 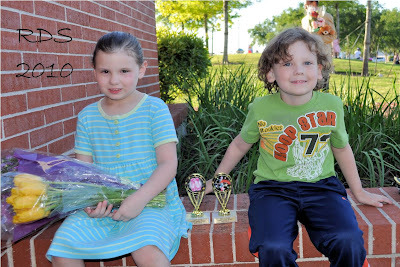 Robin's Dance Studio Recital 2010 was a huge success! The kids danced beautifully and a great time was had by everyone. In our family we had Chloe and Bradley and their cousins: Alexis, Alec, and Meghan dancing. Chloe had 3 Girl Scout sisters and two neighborhood friends there dancing, too. Not very many routines went by that didn't have someone we knew in it - so it was a ton of fun. We celebrated at Chili's, of course since it's the kids' second favorite restaurant (after Rain Forest Cafe). I'm exhausted! Now we can rest until summer dance classes start! 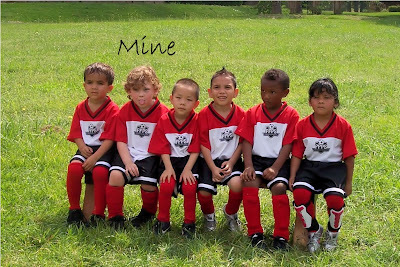 Today in the wicked, bad, humid heat we had soccer pictures. After individual pictures, the kids had to sit on this bench until everyone was done and ready for the group picture. So, I snapped a few of my own while we were waiting. Hopefully Bradley puts on a better face for recital tomorrow!